This article is about the American actor. For other uses, see Clint Eastwood (disambiguation). Clinton Eastwood Jr. (born May 31, 1930) is an American actor, filmmaker, musician, and politician. 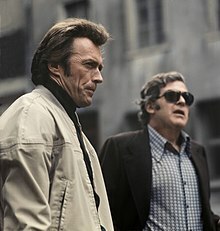 After achieving success in the Western TV series Rawhide, he rose to international fame with his role as the Man with No Name in Italian filmmaker Sergio Leone's Dollars Trilogy of spaghetti Westerns during the 1960s and as antihero cop Harry Callahan in the five Dirty Harry films throughout the 1970s and 1980s. These roles, among others, have made Eastwood an enduring cultural icon of masculinity. In 1973, Eastwood told the late film critic Gene Siskel, "No, I don't believe in God." As much as anything, Eastwood has found spirituality in nature (as suggested by his 1985 Western, Pale Rider), stating that "I was born during the Depression and I was brought up with no specific church. We moved every four or five months during the first 14 years of my life, so I was sent to a different church depending on wherever we lived. Most of them were Protestant, but I went to other churches because my parents wanted me to try to figure out things for myself. They always said, 'I just want to expose you to some religious order and see if that's something you like'. So although my religious training was not really specific, I do feel spiritual things. If I stand on the side of the Grand Canyon and look down, it moves me in some way." "Of course, it would be wonderful to talk with my parents again, who are, of course, deceased. It makes the idea of death much less scary. But then again, if you think that nothing happens after you die, maybe it makes you live life better. Maybe you're supposed to do the best you can by the gift you're given of life and that alone." Eastwood has long shown an interest in politics and is a registered Libertarian. He won election as the nonpartisan mayor of Carmel-by-the-Sea, California in April 1986. In 2001, Governor Gray Davis appointed him to the California State Park and Recreation Commission, where he led opposition to an extension of the toll six-lane 16-mile (26 km) freeway extension of California State Route 241 through San Onofre State Beach. Eastwood endorsed Mitt Romney in the 2012 presidential election. He delivered a prime time address at the 2012 Republican National Convention, where he drew attention for a speech he delivered to an empty chair representing President Barack Obama. ^ It is not clear how many children Eastwood has fathered. When Steve Kroft asked him "How many do you have?" in a November 16, 1997 segment on 60 Minutes, he said, without further elaboration, "I have a few." In a January 14, 2009 interview on Late Show with David Letterman, David Letterman said to Eastwood, "You have uh–is it seven children?" to which he replied "Uh, at least." Furthermore, Eastwood's daughter Alison stated in an August 7, 2011 article in The Sunday Times, "My dad has eight children by six women." However, until December 2018 (when 8 children were photographed together) only seven children by five women were accounted for. ^ Guerra, Victoria. "Clint Eastwood Net Worth: Tom Hanks May Sign Up for Eastwood's Sully Sullenberger Biopic, How Much Is Western Legend Worth? ", www.foodworldnews.com, published June 19, 2015. Retrieved July 11, 2015. ^ Rebecca Leung (January 27, 2004). "Clint Eastwood: Improving with Age". CBS News. ^ "Clint Eastwood Fast Facts". CNN. May 27, 2013. Archived from the original on April 26, 2016. ^ "In the Matter of Locke vs. Eastwood - Page 2". Articles.latimes.com. May 8, 1989. Retrieved June 22, 2017. ^ "Suing Clint Eastwood, Sondra Locke Strikes with Magnum Force". People. May 15, 1989. Retrieved June 22, 2017. ^ Tom Gliatto (March 8, 1999). "Learning Experience". People. Retrieved June 22, 2017. ^ "Behind the Scenes with Clint". Dallas Morning News. October 4, 2003. ^ Junod, Tom (September 19, 2012). "Clint Eastwood Interview - Tom Junod Clint Eastwood Profile". Esquire. Retrieved June 22, 2017. ^ Stated in L'album secret de Clint Eastwood (2012). ^ Duke, Alan (October 25, 2013). "Clint Eastwood's wife files for divorce". CNN.com. Retrieved June 22, 2017. ^ "Clint Eastwood's Daughter, Alison, Speaks Out About Her Father's Split". People. September 6, 2013. Retrieved June 22, 2017. ^ Jennifer Garcia (April 20, 2015). "Scott Eastwood Sexiest Son Alive!". People. Retrieved June 22, 2017. ^ "For father-daughter duo Clint and Alison Eastwood, directing is a family business". Los Angeles Times. June 16, 2016. Retrieved June 22, 2017. ^ Leyde, Tom (September 10, 2017). "Monday profile: Charlotte Townsend, the mayor who lost to Clint Eastwood". Monterey Herald. Retrieved August 18, 2018. ^ "1980s — A very, very famous mayor". The Carmel Pine Cone. February 20, 2015. pp. 22–23. Eastwood opted not to run again for mayor and backed Jean Grace in her successful bid in 1988. ^ Emma Brockes (February 14, 2009). "Emma Brockes meets Clint Eastwood, one of the last American heroes, to talk about films, politics and ageing". the Guardian. Retrieved March 24, 2016. ^ Fischer, Landy & Smith, p. 43. ^ "Clint Eastwood Movie Box Office Results". Box Office Mojo. Retrieved January 17, 2014. ^ Amara, Pavan; Sundberg, Charlotte (May 30, 2010). "Eastwood at 80". The Independent. London. Archived from the original on January 17, 2011. ^ a b Day, Elizabeth (November 2, 2008). "Gentle Man Clint". The Guardian. London, UK. Archived from the original on January 17, 2011. ^ "Famous Descendants". MayflowerHistory.com. Retrieved November 13, 2015. ^ Leung, Rebecca (February 6, 2005). "Two Sides of Clint Eastwood: Lesley Stahl Talks To Oscar-Nominated Actor And Director". CBS Evening News. Archived from the original on January 17, 2011. ^ a b c Locke, Sondra (1997). The Good, the Bad, and the Very Ugly – A Hollywood Journey. William Morrow and Company. ISBN 978-0-688-15462-2. ^ Eastwood, Clint. "Eastwood: In His Own Words". ClinteastWood.net. Retrieved July 8, 2014. ^ Miller, Kenneth. "RD Face to Face: Clint Eastwood". Reader's Digest Australia. Archived from the original on July 26, 2008. ^ Crist, Judith (February 2, 1967). "Plain Murder All the Way". New York World Journal Tribune. ^ Adler, Renata (January 25, 1968). "The Screen:Zane Grey Meets the Marquis de Sade". The New York Times. Retrieved January 9, 2011. ^ Crowther, Bosley (February 2, 1967). "A Fistful of Dollars (1964)". The New York Times. Retrieved January 9, 2011. ^ Manners, Dorothy (July 14, 1968). "Italy Made Eastwood A Hollywood Hero". The Indianapolis Star. Indianapolis, Indiana. p. 117. ^ "Paint Your Wagon (1969)". The New York Times. Archived from the original on January 10, 2011. ^ Hicks, Jerry (March 2003). "A Line to Remember". Orange Coast: 23. ISSN 0279-0483. Retrieved January 13, 2011. ^ Boucher, Geoff (September 7, 2010). "Clint Eastwood as Superman or James Bond? 'It could have happened', he says". Los Angeles Times. Archived from the original on December 11, 2010. ^ Ebert, Roger (January 1, 1976). 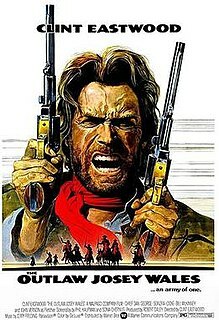 "The Outlaw Josey Wales". Chicago Sun-Times. Archived from the original on January 16, 2010. ^ Ebert, Roger (January 1, 1977). "The Gauntlet". Chicago Sun-Times. Archived from the original on June 12, 2010. ^ a b Maslin, Janet (December 17, 1980). "Any Which Way You Can (1980): Screen: Clint and Clyde". The New York Times. Archived from the original on January 10, 2011. ^ Maslin, Janet (June 11, 1980). "Bronco Billy (1980): Eastwood Stars and Directs 'Bronco Billy'". The New York Times. Archived from the original on January 10, 2011. ^ "1980 Yearly Box Office Results at Boxofficemojo.com". Retrieved November 27, 2014. ^ "Honkytonk Man (1982)". Rotten Tomatoes. Retrieved May 1, 2011. ^ "Frankly, My Dear, I Don't Give A Damn" (PDF). AFI's 100 Years...100 Movie Quotes. Archived (PDF) from the original on March 8, 2011. ^ "Tightrope (1984)". Box Office Mojo. October 23, 1984. Retrieved July 23, 2013. ^ Halbfinger, David M. (September 21, 2006). "The Power of an Image Drives Film by Eastwood". The New York Times. Archived from the original on December 12, 2010. ^ The Film journal. Pubsun Corp. July 1, 1988. p. 24. Retrieved May 1, 2011. ^ Ebert, Roger (1992). Roger Ebert's movie home companion. Andrews and McMeel. ISBN 978-0-8362-6243-8. Retrieved May 1, 2011. ^ Canby, Vincent (August 7, 1992). "Unfo". The New York Times. Retrieved January 17, 2011. ^ American Film Institute (June 17, 2008). "AFI Crowns Top 10 Films in 10 Classic Genres". ComingSoon.net. Retrieved January 17, 2011. ^ "Top Western". American Film Institute. Archived from the original on January 31, 2011. ^ Maslin, Janet (November 24, 1993). "A Perfect World; Where Destiny Is Sad and Scars Never Heal". The New York Times. Archived from the original on December 12, 2010. ^ Hinson, Hall (November 24, 1993). "'A Perfect World'". The Washington Post. Archived from the original on December 12, 2010. ^ Ebert, Roger (June 2, 1995). "The Bridges of Madison County". Chicago Sun-Times. Archived from the original on March 27, 2010. ^ "Absolute Power (1997)". Rotten Tomatoes. Retrieved January 13, 2011. ^ Ebert, Roger (November 21, 1997). "Midnight in the Garden of Good and Evil". Chicago Sun-Times. Archived from the original on September 19, 2009. ^ Maslin, Janet (March 19, 1999). "True Crime". The New York Times. Retrieved January 30, 2011. ^ "Space Cowboys (2000)". Rotten Tomatoes. Retrieved February 16, 2011. ^ Ebert, Roger (August 4, 2000). "Space Cowboys". Chicago Sun-Times. Archived from the original on June 12, 2010. Retrieved February 16, 2011. ^ "Blood Work (2002)". Rotten Tomatoes. Retrieved January 10, 2011. ^ "Acclaim flows for 'Mystic River' at Oscars". The New Zealand Herald. Reuters. March 2, 2004. Archived from the original on January 24, 2011. ^ "Mystic River". Box Office Mojo. Retrieved September 4, 2009. ^ "Clint Eastwood". New York Times. Retrieved November 25, 2013. ^ "Directing: Directors with 2 or More Directing Awards". Academy of Motion Picture Arts and Sciences. Archived from the original on March 1, 2009. Retrieved January 10, 2011. ^ D'Angelo, Jennifer (February 28, 2005). "'Million Dollar Baby' Wins Best Picture Oscar". FOX News. Archived from the original on January 11, 2011. ^ Scott, A. O. (December 14, 2004). "3 People Seduced by the Bloody Allure of the Ring". The New York Times. Archived from the original on January 31, 2011. ^ "Winners & Nominees-Letters From Iwo Jima". HOLLYWOOD FOREIGN PRESS ASSOCIATION. Retrieved February 20, 2018. ^ McClintock, Pamela (March 10, 2009). "Clint mints overseas box office". Variety. Archived from the original on December 12, 2010. ^ Wise, Damon (May 20, 2008). "Clint Eastwood's Changeling Is The Best of the Festival So Far". Empire. Archived from the original on November 17, 2011. ^ McCarthy, Todd (May 20, 2008). "'Changeling' review". Variety. Archived from the original on January 14, 2011. ^ a b "Winners & Nominees-Clint Eastwood". HOLLYWOOD FOREIGN PRESS ASSOCIATION. Retrieved February 20, 2018. ^ "62nd British Academy Film Awards". British Academy Film Television Award (BAFTA). Retrieved February 20, 2018. ^ "Clint Eastwood leads box office with 'Gran Torino'". Forbes. Reuters. January 11, 2009. Archived from the original on January 11, 2011. ^ "Box Office Mojo - Clint Eastwood". imdb.com. Retrieved February 20, 2018. ^ Keller, Bill (August 15, 2008). "Entering the Scrum". The New York Times. Archived from the original on June 2, 2013. ^ Ebert, Roger (December 9, 2009). "Invictus". Chicago Sun-Times. Archived from the original on December 13, 2009. ^ McCarthy, Todd (November 27, 2009). "Invictus". Variety. Archived from the original on January 16, 2013. ^ Punter, Jennie (August 17, 2010). "Eastwood, Boyle among new Toronto entries". Variety. Archived from the original on November 6, 2012. ^ Mercer, Benjamin (October 11, 2010). "Eastwood's 'Hereafter': Matt Damon Shines, Despite Schmaltz". The Atlantic. Archived from the original on January 11, 2011. ^ "Hereafter Movie Reviews, Pictures". Rotten Tomatoes. Retrieved October 30, 2010. ^ Mergner, Lee (November 29, 2010). "In Dave Brubeck's Own Sweet Way". JazzTimes. Archived from the original on January 14, 2011. ^ Rosenberg, Adam (June 18, 2010). "Leonardo DiCaprio To Star in J. Edgar Hoover Biopic". MTV.com. Archived from the original on January 22, 2011. ^ "J. Edgar (2011)". Rotten Tomatoes. Flixster. Retrieved November 10, 2011. ^ Ebert, Roger (November 8, 2011). "J. Edgar". The Chicago Sun-Times. Retrieved January 16, 2018. ^ Edelstein, David (November 14, 2011). "First World Problems". The Movie Review. New York. ISSN 0028-7369. Retrieved February 28, 2019. ^ Breznican, Anthony (October 5, 2011). "Clint Eastwood may act again in baseball drama – Breaking". Entertainment Weekly. Archived from the original on October 6, 2011. ^ The Eastwood Factor (Extended Edition) (DVD). Warner Home Video. June 1, 2010. Event occurs at 1:26:15. ^ "Clint Eastwood On Chrysler Super Bowl Commercial: 'I'm Not Politically Affiliated With Mr. Obama'". The Huffington Post. February 6, 2012. ^ "Clint Eastwood's Jersey Boys Movie, Starring Tony Winner John Lloyd Young, Sets 2014 Release Date". Broadway.com. Retrieved November 27, 2014. ^ Kit, Borys (August 21, 2013). "Clint Eastwood in Talks to Direct 'American Sniper'". The Hollywood Reporter. Retrieved November 5, 2013. ^ "'American Sniper' as Eastwood's biggest film?". CNBC. Retrieved December 4, 2015. ^ "American Sniper (2014) – Box Office Mojo". www.boxofficemojo.com. Retrieved December 4, 2015. ^ Wilson, Michael (September 7, 2016). "In 'Sully,' New York Is Clint Eastwood's Latest Star". The New York Times. Retrieved January 2, 2018. ^ "Sully (2016)". Box Office Mojo. Retrieved January 16, 2018. ^ Jenkins, Aric (February 9, 2018). "The True Story Behind the Movie The 15:17 to Paris". Time. Retrieved February 10, 2018. ^ "The 15:17 to Paris (2018)". Rotten Tomatoes. Retrieved March 26, 2018. ^ Anthony D'Alessandro (September 27, 2018). "Clint Eastwood's 'The Mule' Kicks Its Way Onto December Release Calendar". deadline.com. Retrieved November 28, 2018. ^ a b Denby, David (March 8, 2010). "Out of the West". The New Yorker. Retrieved September 1, 2012. ^ Fayard, Judy (July 23, 1971). Who can stand 32,580 seconds of Clint Eastwood?. Life. p. 46. ISSN 0024-3019. Retrieved March 8, 2011. ^ French, Philip (February 25, 2007). "Interview: Clint Eastwood, 'I figured I'd retire gradually, just ride off into the sunset ...'". The Guardian. London. Archived from the original on January 31, 2011. ^ Matier, Phillip; Ross, Andrew (December 6, 2006). "Eastwood to share top billing in Hall of Fame". San Francisco Chronicle. Archived from the original on January 11, 2011. ^ "Eastwood receives French honour". BBC News Online. February 17, 2007. Archived from the original on December 12, 2010. ^ Simmons, Christine (February 25, 2010). "Bob Dylan, Clint Eastwood get White House awards". USA Today. Archived from the original on January 18, 2011. ^ Bowen, Rebecca (September 13, 2007). "Berklee awards Clint Eastwood honorary doctorate". Paste. Archived from the original on January 18, 2011. ^ "An honorary Trojan". Los Angeles Times. May 12, 2007. Retrieved January 17, 2011. ^ "Clint Eastwood receives Japanese decoration in LA". Allvoices. Kyodo News, via Japan Today. July 22, 2009. Archived from the original on June 17, 2014. Retrieved June 16, 2014. ^ "Clint Eastwood, Ryuichi Sakamoto And Gerald Fried To Receive Golden Pine Awards For Lifetime Achievement". ISFMF. October 18, 2013. Retrieved April 25, 2014. ^ Rowan, Terry (2015). Who's Who In Hollywood!. Lulu.com. p. 105. ISBN 9781329074491. ^ Zad, Martie (14 June 1992). "'Rawhide's' Cattle Drives, Eastwood On Home Videos". Washington Post. Archived from the original on 30 July 2018. Retrieved 31 July 2018. ^ "Clint Eastwood". Box Office Mojo. Retrieved January 16, 2011. ^ Munn, Michael (1992). Clint Eastwood: Hollywood's Loner. London: Robson. ISBN 978-0-86051-790-0. ^ The Good, the Bad and the Ugly Young, Josh (May 4, 1997). The Independent. ^ "Clint Eastwood After 70". Parade. Archived from the original on November 14, 2012. ^ "Clint Eastwood dated Frances Fisher". Zimbio. Livingly Media, Inc. auFeminin Group. Retrieved 26 September 2018. ^ "Clint's wife expecting". Toronto Star. Reuters. September 6, 1996. Retrieved March 7, 2011. ^ Corliss, Richard (August 10, 1992). "The Last Roundup". Time. ^ a b c Headlam, Bruce (December 10, 2008). "The Films Are for Him. Got That?". The New York Times. Archived from the original on January 11, 2011. ^ "Welcome to Mission Ranch". Mission Ranch Hotel and Restaurant. Archived from the original on January 10, 2011. ^ Weiss, Kenneth R. (June 14, 2007). "California rejects Clint Eastwood's Monterey golf course". Los Angeles Times. Archived from the original on January 10, 2011. ^ "Clint Eastwood 'Makes Their Day'". The Stroke Association. March 18, 2002. Archived from the original on January 9, 2011. ^ Gene Siskel, "Clint: The Cynical King who Outdrew the Duke," Chicago Tribune, January 7, 1973. ^ a b "SHOWBIZ SPY - OUR SPIES ARE EVERYWHERE!". SHOWBIZ SPY. Archived from the original on November 10, 2013. Retrieved June 2, 2018. ^ "Welcome to Mission Ranch". 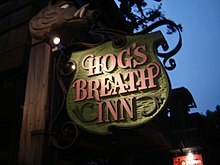 Missionranchcarmel.com. Retrieved April 30, 2010. ^ Weiss, Kenneth R. (June 14, 2007). "California rejects Clint Eastwood's Monterey golf course". Los Angeles Times. Retrieved May 2, 2010. ^ "Clint Eastwood "Makes Their Day"". The Stroke Association. March 18, 2002. Retrieved April 29, 2010. ^ "Clint Eastwood talks to Jeff Dawson". The Guardian. London. June 6, 2008. Archived from the original on December 12, 2010. ^ "Governor Schwarzenegger Appointments to the State Park and Recreation Commission" Archived January 4, 2009, at the Wayback Machine – California State Park and Recreation Commission. Retrieved: May 28, 2008. ^ a b "Krall, Eastwood Team For 'crime'". Billboard. AllBusiness.com. March 11, 1999. Archived from the original on December 12, 2010. ^ Tosches, Nick. "Nick Tosches on Clint Eastwood". Vanity Fair. Retrieved September 8, 2012. ^ "Hollywood Foreign Press Association 2008 Golden Globe Awards For the Year Ended December 31, 2007". goldenglobes.org. December 13, 2007. Archived from the original on December 14, 2007. Retrieved January 19, 2011. ^ "Clint Eastwood Receives Berklee Degree at Monterey Jazz Festival (news release)". Berklee College of Music. September 24, 2007. Archived from the original on December 12, 2010. The Outlaw Josey Wales is a 1976 American revisionist Western DeLuxe Color and Panavision film set during and after the American Civil War. It was directed by and starred Clint Eastwood, with Chief Dan George, Sondra Locke, Sam Bottoms, and Geraldine Keams. The film tells the story of Josey Wales, a Missouri farmer whose family is murdered by Union militants during the Civil War. Driven to revenge, Wales joins a Confederate guerrilla band and fights in the Civil War. After the war, all the fighters in Wales' group except for Wales surrender to Union officers, but they end up being massacred. Wales becomes an outlaw and is pursued by bounty hunters and Union soldiers. 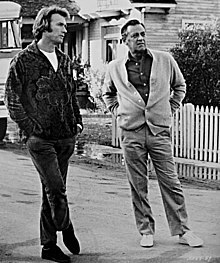 Thunderbolt and Lightfoot is a 1974 American crime film written and directed by Michael Cimino and starring Clint Eastwood, Jeff Bridges, George Kennedy, and Geoffrey Lewis. The Eiger Sanction is a 1975 American thriller film directed by and starring Clint Eastwood. Based on the 1972 novel The Eiger Sanction by Trevanian, the film is about an art history professor, mountain climber and former assassin once employed by a secret United States government agency who is blackmailed into returning to his deadly profession and do one more "sanction", a euphemism for killing. He agrees to join an international climbing team in Switzerland planning an ascent of the Eiger north face in order to complete a second sanction to avenge the murder of an old friend. The film was produced by Robert Daley for Eastwood's Malpaso Company, with Richard D. Zanuck and David Brown as executive producers, and co-starred George Kennedy, Vonetta McGee and Jack Cassidy. Two Mules for Sister Sara is a 1970 American-Mexican western film directed by Don Siegel and starring Shirley MacLaine set during the French intervention in Mexico (1861-1867). The film was to have been the first in a five-year exclusive association between Universal Pictures and Sanen Productions of Mexico. The film marked the second of five collaborations between Siegel and Eastwood, following Coogan's Bluff (1968). The collaboration continued with The Beguiled and Dirty Harry and finally Escape from Alcatraz (1979). Clint Eastwood is an American film actor, director, producer, and composer. 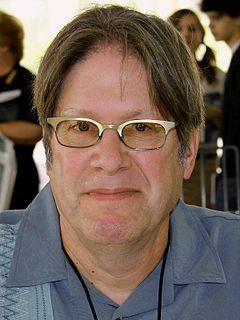 After beginning his acting career primarily with small uncredited film roles and television appearances, his career has spanned more than 50 years in both television and film productions. Eastwood appeared in several television series, most notably starring in Rawhide. His role in the eight-season series led to his leading roles in A Fistful of Dollars, For a Few Dollars More, and The Good, the Bad and the Ugly. Eastwood has starred in 42 films, including Hang 'Em High, Escape from Alcatraz, The Bridges of Madison County, and Gran Torino. Eastwood's started directing in 1971, and in 1982, his debut as a producer began with two films, Firefox and Honkytonk Man. 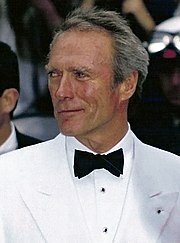 Eastwood also has contributed music to his films, either through performing, writing, or composing. He has appeared mainly in western, action, comedy, and drama films. Patrick McGilligan is an Irish American biographer, film historian and writer. His biography on Alfred Hitchcock, Alfred Hitchcock: A Life in Darkness and Light was a finalist for the Edgar Award. He is the author of two New York Times Notable Books, and he lives in Milwaukee, Wisconsin. He is also noted for his biography on Clint Eastwood, Clint: The Life and Legend, which reveals much about Eastwood which his official biography by Richard Schickel left out. In addition to Hitchcock and Eastwood, he has written biographies on Robert Altman, James Cagney, George Cukor, Fritz Lang, Oscar Micheaux, Jack Nicholson, and Nicholas Ray. He is also an editor of Backstory, which features interviews of Hollywood screenwriters and is published by the University of California Press.